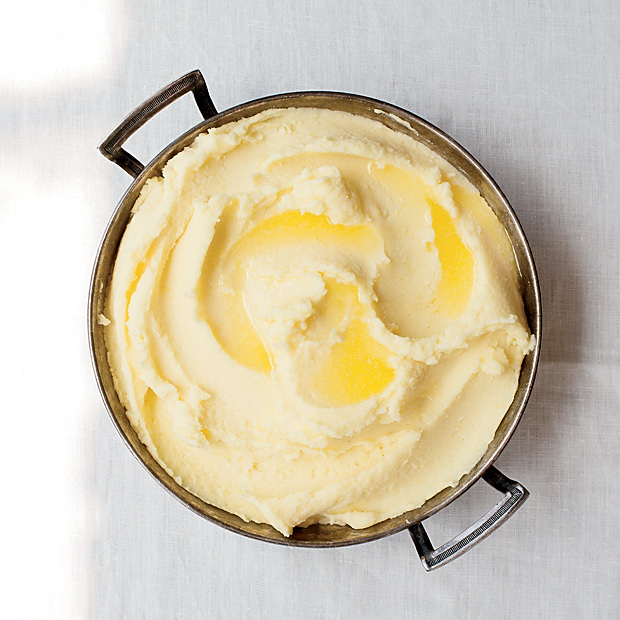 In a large saucepan, cover the potatoes with water and bring to a boil. Add 2 tablespoons of salt and simmer until tender, 15 to 20 minutes. Drain well and let stand in a colander for 3 minutes. Pass the potatoes through a ricer into the large saucepan. Cook over moderate heat, stirring with a wooden spoon, until the potatoes are hot and steam starts to rise, about 2 minutes; they’ll start to stick to the bottom of the pan. Add one-fourth of the butter cubes at a time, stirring constantly until incorporated. Stir in the heavy cream and season generously with salt. Serve right away. Review Body: So good. Yep, six sticks more than works. You could probably get away with 5, but I'm not sure you'd get the same unique texture. It was almost like polenta/grits but smoother? It's totally something you don't want to make more than 1-2 times a year. Review Body: Im sick of the same potato mash that my mom cooks for me. Will be sending the link! Review Body: Six sticks of butter?? Review Body: Hey if I read this right you start with 6 sticks of cold butter diced. Then you add in 1/4 of the butter, then milke and then serve. What do you do with the other 4 1/2 sticks of butter? Review Body: heres the original. its so much better than this recipe: - 1 kilogam de pommes de terre (Ratte ou BF 15) ( I use 1/2 Yukon Gold and 1/2 Russet) - 20 à 30 centiliters de lait entier (20 to 30 centiliters whole milk. There are 23.66 centiliters in 1 cup) - 250 g de beurre (250 grams of unsalted butter.) - Sel de mer (sea salt) Notice: no cream and a ratio of 4 parts potato to 1 part butter. Also, boil potatoes with skin on, drain then peel.